You are currently browsing the Archaeofacts.com archives of Musings for the day Monday, May 15th, 2017. This is a crappy shot to illustrate what I’ve been calling the velveteen cape—the apparent piecework of fields and the green hedges that separate them. When it’s a big expanse of the landscape, and you’re a bit above it, the rolling contours and the fields really look like a textured quilt to me. 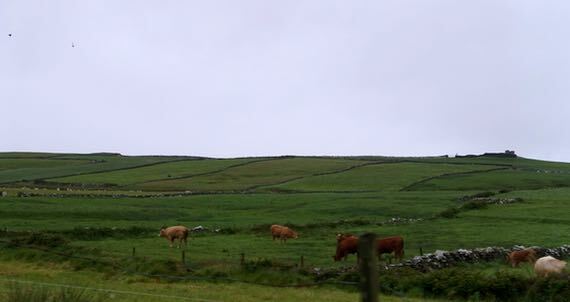 In contrast, when the fields are demarcated by stone walls, I no longer see a giant cape. Still eye-catching, but different. One of our big points-of-interest for the day was the Cliffs of Moher. Only it was rainy and windy, too rainy to make it worth €6 apiece to join the crowds released from buses to fight our way against a headwind to the overlook to hang over the fence to take a picture before turning tail and scooting back across the road to the parking area. Are we wimps? Instead, we explored one-and-a-half lane roads and small towns we would have skipped to “do” the Cliffs, and thoroughly enjoyed ourselves. 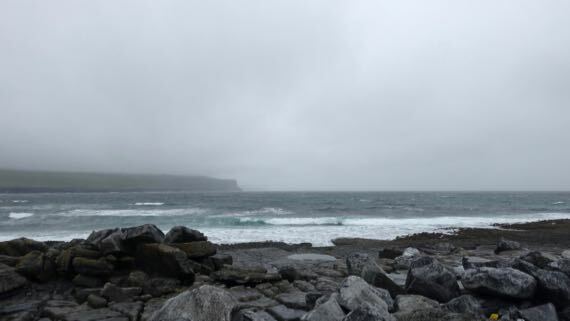 This town is named Doolin. Eventually we cut inland and visited a stone cashel/fort. This cashel was among the domiciles of a minor sept, the O’Davoren family, Brehon lawyers for their overlords, the O’Loughlins, lords of Burren, and both the popular and academic literature places their law school at this cashel. However, recent research indicates the law school buildings were not in the cashel, but less than a kilometer away occupying a complex of buildings that seems more suitably sized for such an institution. 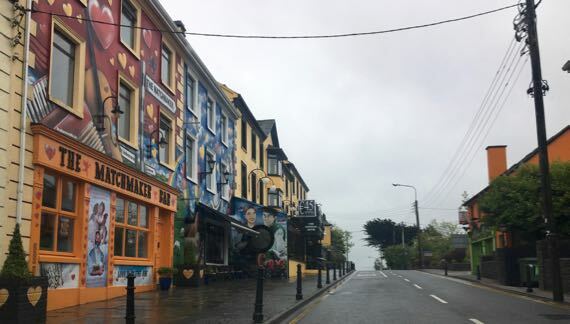 O’Davorens did live here in the 16th and 17th Cs; as negotiators for their superiors, they were well-connected to the greater world far beyond this area, which had a far greater population than it does today. The name of this place in English is Cahermacnaghten; the Irish name is Cathair Mhic Neachtain. 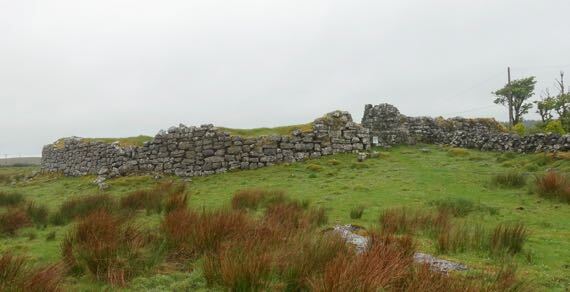 This fortified homestead was first built long before the period of the Brehon law school. 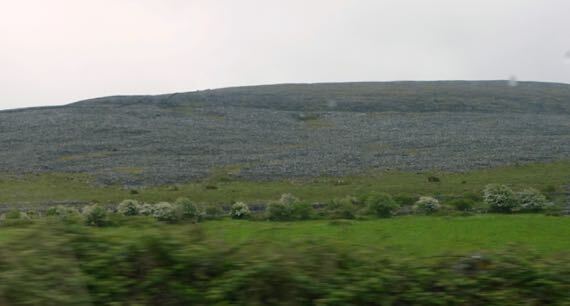 The Burren is an area of rolling limestone hills and stone surfaces exposed by glaciation in this part of western Ireland. 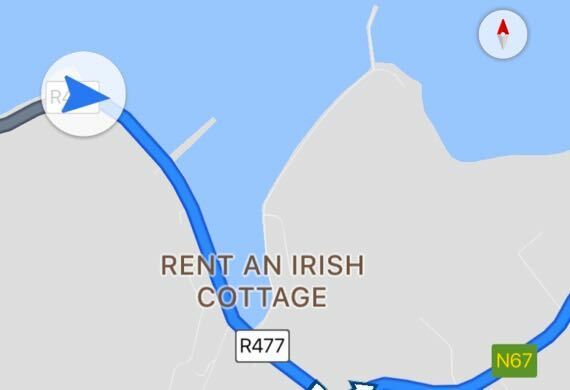 This particular area is next to the sea. I saw one place where blocks had been removed, no doubt for building stone—very blocky. 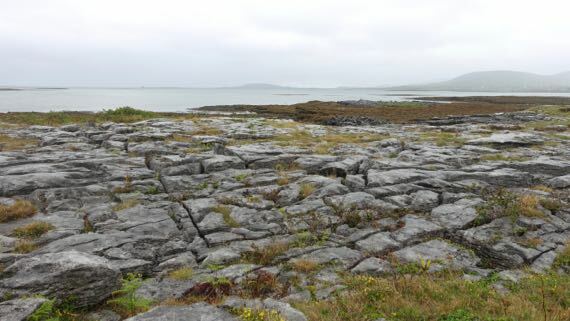 The blocks are called clints and the fissures are called grykes/grikes/scailps. There’s poetry in these words! From what we saw of the uplands, the “pavement” quality is not as extensive—it looks like grey rubble here. Note that the lower areas are green, and we hypothesized that considerable labor had been invested to remove the rocks. Apologies for the crappy snap; it was the best of the crop. 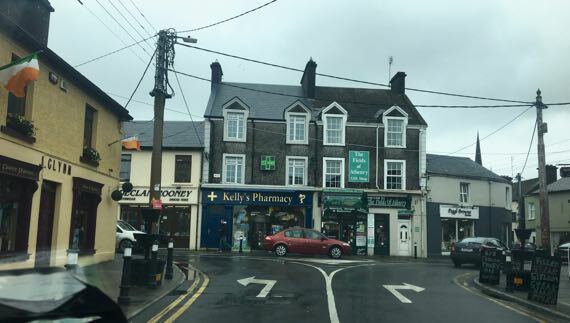 Here’s a left-or-right choice in Athenry, a town east of Galway that we visited because it has notable surviving medieval city wall. 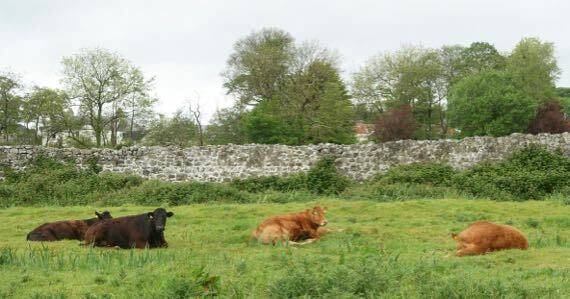 Here is the wall behind the cud-chewing cattle. There’s a ditch outside the wall (green bushy vegetation), and I think traces of piled soil outside of that. Anyway, for a tourist calling card, the wall receives no emphasis whatsoever, and no good access. I think all that light grey outlining the stones indicates recent reconstruction…which is fine. But. We are rolling through Galway by the harbor, excuse me harbour. I don’t remember an in-town light-up sign before, and it caught my eye. 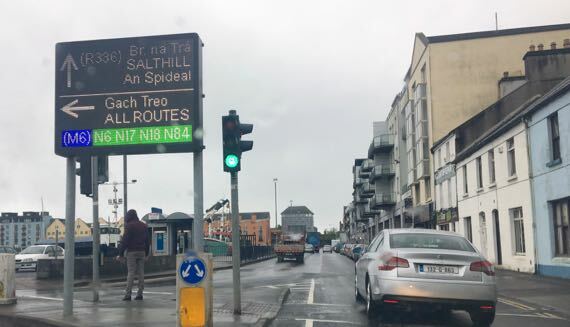 Coming into cities, we have seen light-up signs that list the names of the parking areas and the number of open spaces. Very handy! And now for something completely different. Three somethings. 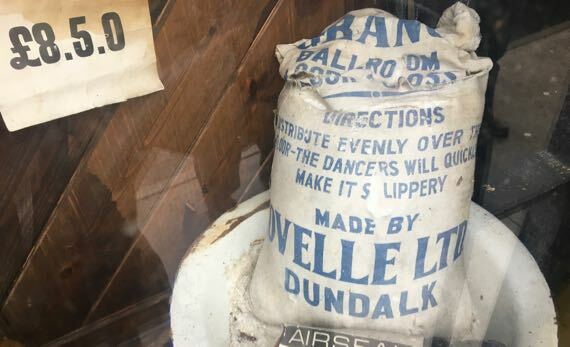 This is a powder or dust that apparently was applied to ballroom floors to make it the right amount of slippery for dancers. Dundalk is on the east shore of the island and we are on the west. This bag was in a display in an “antiques” shop window. 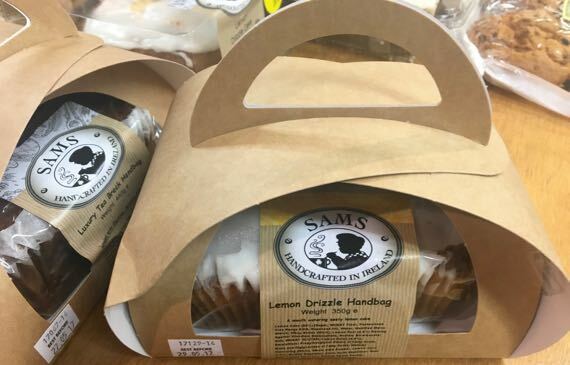 Here’s what’s called a Sams Lemon Drizzle Handbag, a cleverly folded package for a cake, handcrafted in Ireland. This cracked me up when I found it while navigating. Someone has slipped a little joke past GooMaps.